The need for document destruction is eminent for everyone, especially in urban areas, as crime related to stealing an individual’s personal information is everywhere around us along with an enormous amount of unused and unwanted documents that pile up in our homes. These piles of paper that no one knows what to do with usually take the form of paper, magazines, books, files, etc. and collects in mass quantities over a period of time. We want to do something about the ever-growing stacks upon stacks of papers but always seem to have an excuse ready. Fortunately, document destruction does not have to be so overwhelming, in fact it can be made much easier with the help of a shredding company. 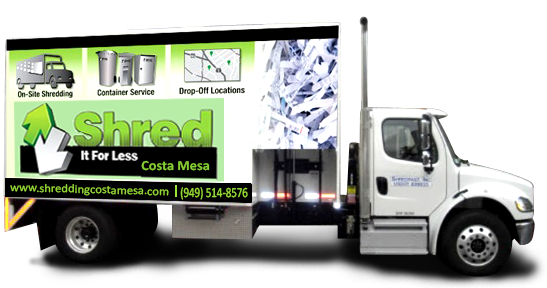 Shred Connect has been at the vanguard of paper shredding services and secure document shredding costa mesa for many years. Located in Costa Mesa and other communities throughout Orange County, we provide fast, efficient, and affordable document destruction that won’t break your bank account. Our forte is identifying and satisfying our clients’ paper shredding needs with minimum hassle. We offer state-of-the-art paper shredding services and document destruction that are tailored to fit the needs of residential and commercial customers alike. At Shred Connect we offer two approaches that our customers like and appreciate. One of which is our unique drop-off sites and the other is our mobile shredding house calls. 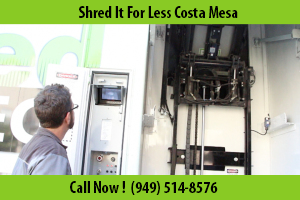 Shred Connect’s drop sites are located strategically throughout Orange County, including Costa Mesa. All you do is bring in your old or outdated materials to our convenient location nearest to you and we later shred them and send you a Certificate of Destruction so you can rest assured knowing your documents have been shredded and no one will ever be able to see them again. You only pay for what you want shredded. If you would prefer we make a document destruction costa mesa house call, we encourage you to call ahead and schedule an appointment. This ensures that we allow our customers and ourselves sufficient time for a thorough, accurate, completed task. Shred Connect also provides our customers a Certificate of Destruction when the job is finished to their satisfaction. Other shredding companies tack on hidden fees in order to justify the cost of doing business in this day and age. Shred Connect never charges any add-on monies or fuel surcharges. We see no need to procure additional debt, much less alienate our loyal customer base. 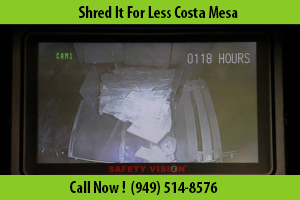 Our no-frills approach to our work ensures that any secure document shredding costa mesa done is completed on time, with very little wasted effort. Our employees love what they do and are very good at fulfilling each customers wants and needs. We provide punctual, thorough document destruction that reflects upon our public perception and induces individuals to continue requesting our paper shredding services.